I learned a lesson yesterday. I learned that it pays off to take a rest when your mind and body is telling you rather than try to push through. I used my down time well. I caught up on reading art related stuff as well as my favorite genre of reading, science fiction. The only magazine I subscribe to at this time is the online magazine called Artists on Art. I have mentioned it on my blog before and I believe I have a link on the sidebar. Yesterday I read an article written by a young artist (well, young to me) named, Hsin-Yao Tseng. He wrote a nice article called Pochade/Building Skills Through Quick Painting. In a nutshell he was encouraging artists to get out of the studio and do quick paint sketches 30-60 minutes long to help build your sight, color, and memory skills. Doubly important for those that use photo references to paint from, which at this time I do not. Quick sketching, or gesture sketching when drawing the figure, is something I have done myself frequently but I haven't done a 60 minute oil sketch en plein air. 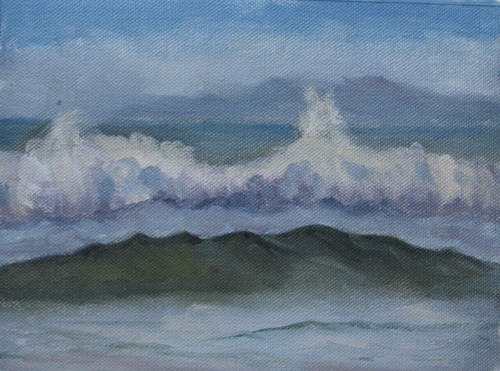 I decided to do that today for yesterdays challenge day as well as a regular plein air painting for today's entry. This was painted directly after the first one and the tide was going way out. The day was sunny and warm with a bit of water haze. My time is really short this evening as I have a band rehearsal. These are also Wave Studies number 24 and 25! 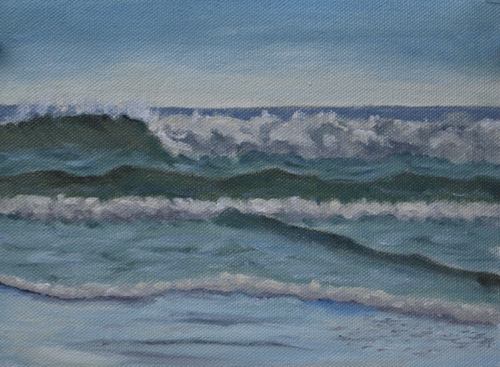 I am one quarter of the way through my goal of 100 wave studies. I am rather excited about that. Next 25 I will be half way! Just because I don't leave a comment every day doesn't mean that I'm not checking in to see what lovely creation you have produced. Love the quick oil sketch and I have to tell you Renee, you have inspired me to do something about my poor/non existent sketching skills. I have often wished that I could master even a most basic sketch or two of things I see around here and by gum, I'm giving it a whirl, armed with a book or two, paper and some pencils. Sadly none of the artists at the Ashland Art Center are doing a basic sketching class. I surely would have signed up. Hi Theresa! I read your blog too although I haven't left a comment in ages. I have been skimming through my favorites, one of which is yours of course, and will be back to commenting when this challenge is up. Get a book, paper and pencils or sketchbook, get some friends too if possible, that really helps. Perhaps some online friends. If you have time (you are pretty busy) check out some videos on YouTube. Then, sit down and sketch. Honestly that is 99 percent of what goes into it. Of course, good instruction goes a long way too. Hope you do it!